Making art that responds to music can increase sensory awareness, facilitate mindfulness, and encourage emotional expression. 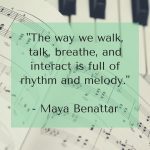 Last week’s guest post from music therapist Maya Benattar discussed the value of deep listening to music with our clients in session or for our own self-care and processing as therapists. 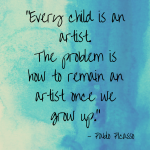 This week I want to share about pairing music with art-making for another creative approach. 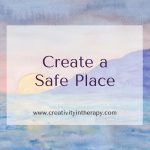 A simple but powerful art therapy activity that you can do with clients is to have them listen to music and paint or draw to respond to the music. Choose (or let your client choose) instrumental music without lyrics. First, ask them to listen to the music for a moment. Then direct them to begin the art. (Or another variation is to listen to the song until it is finished and then create the image/artwork.) This directive can be phrased in a few different ways and each may draw out a different response from your client. “Listen mindfully to the music until it ends. Notice your breath and sensations in your body as you listen. Allow images to arise in your mind as you listen.” When the music has ended, ask the client to make art of the image that came to mind. You may want to remind your clients that there is no right or wrong way to respond to the music. They should set aside preconceived expectations, try to focus on mindful immersion in the music and art, and trust their intuition as they work. There are multiple benefits to this art exercise, which can vary based on the structure, the process, and the clients needs. 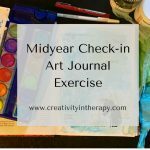 I find that this art therapy directive helps clients to practice mindfulness (after we have talked about mindfulness in art-making), have a more intuitive experience of art, and be more in touch with their body, sensations, and emotions. The music helps to keep clients focused on the present moment and also helps to provide a starting point for inspiration. For clients that are very cognitively focused, this can be a good exercise to encourage something different, helping them step away from planning and overthinking. In Expressive Therapies Continuum*, Lisa Hinz suggests painting to music as an art activity that activates the Kinesthetic-Sensory Components and the Affective Component. 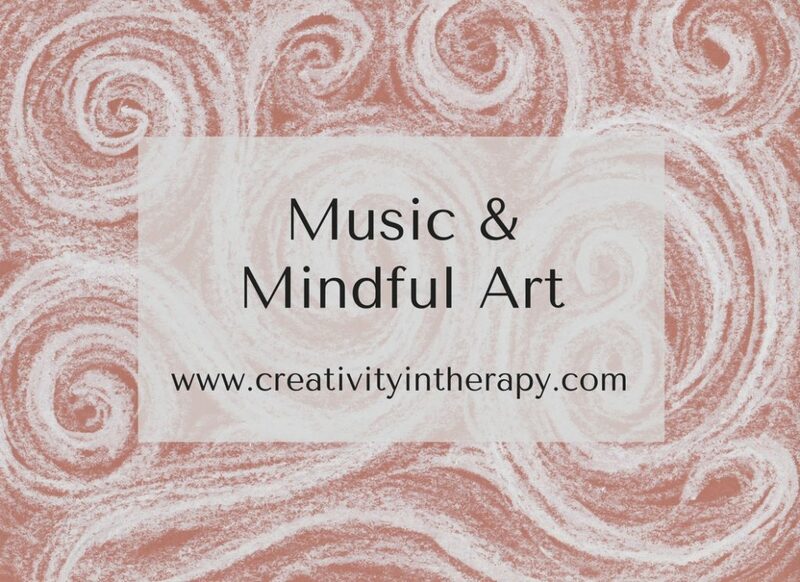 In Mindfulness and the Arts Therapies*, Carolyn Van Dort and Denise Grocke share about leading clients through an experience of mindful relaxation, listening to music, observing images that come into the mind, and then writing about or making art of these images. 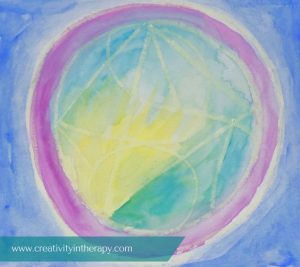 This process both helped clients to develop mindfulness and to develop deeper self-understanding through the symbolic images that arise from the unconscious. I didn’t realize how much of an effect the way the directive is phrased could have until trying this activity in a few different settings. On my own, my natural inclination is to use this as a chance for intuitive, abstract art, responding with colors, gestures, and marks that respond to the music as I listen. 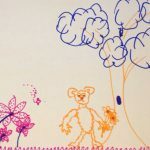 When doing this activity in an art therapy consult group, the suggestion was given to notice an image that arises in your mind, which led me to include something more representational. For another variation, the therapist can intentionally choose a few pieces of music that are very different from each other in rhythm, temp, and the emotions that they evoke. Have clients do a different art piece for each song to help highlight the differences both in the sensory aspects of the music and the emotions that are triggered. 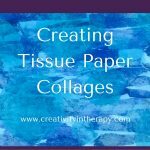 Personally, doing this activity in a training several years ago was a very helpful experience for me in connecting to my bodily sensations and noticing how I am affected by different sensory inputs. Try to be mindful of the art media that you are providing, of course. 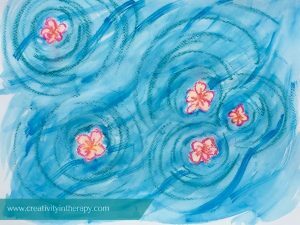 Generally, this is an art therapy exercise that will be best done with a fluid media – I love to do watercolor on wet paper – so that the movements, sensations, and emotions can be easily expressed. However, there may be circumstance in which a more structured drawing medium will be better for your client and this should be considered. I know there are also circumstances in which art therapists can only really provide basic drawing materials like colored pencils and markers (such as school-based and home-based services), but this activity can still be enjoyable and beneficial with these media. As always, I’d love to hear your thoughts! Comment below – have you tried this intervention with clients or done this art activity yourself? And I always love to see the art that others are doing – if you share a picture of your music-inspired art on Instagram, be sure to tag @creativityintherapy so that I can see it. Want to learn more? Scroll down for Amazon links to the books that I mentioned. They are both a great art therapy resource. Thank you Carolyn for this lovely post. I am a ‘Light Color and Darkness Painting Therapist’. LCD Therapy is based on the teachings of Liane Collot d’Herbois and Rudolf Steiner’s philosophy of Anthroposophy. It is always exciting to find new ways of working with the creative process and incorporating that into the processes that I have been trained in. I look forward to reading more of your posts. I’ll have to look more into LCD therapy. Sounds interesting! Thanks for reading the blog.